The 2018 Acura MDX is a popular pick in the three-row crossover SUV segment, bringing you confident performance and lots of technology for a price that won’t break your budget. In addition, the MDX also features a genuinely luxurious interior. Take a look at some of the key aspects of the 2018 Acura MDX interior below, and come by Acura of Ocean near Freehold for a closer look. The available rear entertainment system comes with a fold-down rear screen integrated into the ceiling of the vehicle. It comes with an HDMI input and is offered with split screen functionality so people can watch different things in back. Enjoy the rich sounds of this 10-speaker ELS Studio® Premium Audio System, with studio-quality sound throughout the entire cabin. The Entertainment Package adds one or two more speakers in back. Enjoy the tastefully upholstered leather upholstery and trim accents, alongside pristine wood grain accents. The driver, front passenger, and rear seat passengers can set their preferred temperature thanks to the integrated tri-zone automatic climate control system. 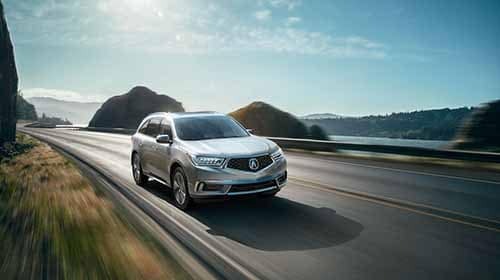 The MDX is a three-row crossover SUV that’s offered with standard seating for seven passengers, as well as available second-row captain’s chairs that decrease seating capacity to six. The total interior volume of the 2018 MDX is a spacious 147.6 cubic feet, which includes 14.9 cubic feet dedicated for cargo in back, as well as a max cargo volume of 68.4 cubic feet, giving you plenty of room to help a friend move in Matawan or head out of Red Bank for the weekend. There’s a lot to be excited about inside and outside the 2018 Acura MDX, like its competitive fuel economy. See how it compares to the Infiniti QX60 and experience it all right now at Acura of Ocean, your Matawan area Acura dealership at 909 Route 35 in Ocean, NJ. We’re open Monday through Saturday, and you can reach us at (732) 776-5200.